A few years ago, I put together a list of the top investing books. By top I mean if someone new to investing asked me for my single favorite book I would recommend X – after thinking about it for a while I decided that since about 80% of investors will underperform the market (its a law of math related not to trends but market returns minus costs), among other reasons the book should be one on smart asset allocation. Ergo, I decied the top book on the topic is William Bernstein’s The Four Pillars of Investing: Lessons for Building a Winning Portfolio (affiliate link, and while I am at it his other books here, but it wont cost you extra, unlike the active mutual funds you are about to hear about :) ) I was honored when William Bernstein reached out to us to comment on an article and told him in ernst that little tidbit. I am honored to present my favorite author William J Bernstein, not that Dr. Bernstein needs my approval! William or Bill was interviewed by ValueTalk’s Raul Panganiban. The audio was recorded a few days ago and the transcript will be available shortly. An outline of the talk can be found below the audio embed. 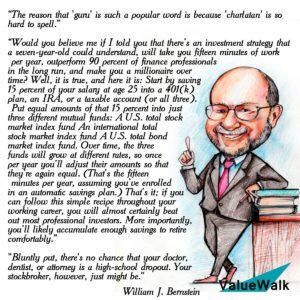 Welcome to another very special episode with William J Bernstein. He is an incredible guest and financial thought leader. We cover a wide range of topics in this episode. 1:45 Can you describe your 1972 doctoral thesis? 3:55 Can you describe that process of working on your phd and the lessons you learned pursing that? 6:29 What lessons did you learn in information gathering? 11:04 Just want to ask you about your advisor, professor Melvin calvin, how important was he to you? 17:24 What led you to finance and investing? 22:00 What are your views on the value premium? 26:26 What are your views on the small cap premium? 28:43 What are your views on bitcoin? 34:14 What is your advice for new investors? 37:42 What is the best way to vet the right informational sources? 45:25 How do you go about finding the relevant information when you write a book? 53:43 What are your favorite books and books you are currently reading now? 56:25 What are your recommended finance journal articles? Thank you for the listen and please enjoy!